Regular readers know I avoid diversions into politics, unless they bear directly on business. But the flap over Michael Wolff’s inside-the-White-House book—Fire and Fury—deserves some attention, if only because of what it says about the state of our national discourse. The book is filled with salacious details about the Trump White House, and prompted the President to lash out against former aide Steve Bannon for his derogatory quotes. It has given cable news outlets fodder for 24 straight hours of programming. It is being released today—four days earlier than originally planned. As an example, Podhoretz cites Wolff quoting Trump as saying “who’s that?” when Roger Ailes suggests House Speaker John Boehner should be his chief of staff. It’s an absurd anecdote—Trump clearly knows who Boehner is, spoke and tweeted about him regularly, and even golfed with him. Politico’s Ben White similarly casts doubt on part of the book vaguely referencing an email “purporting to represent the views of Gary Cohn” that viciously attacked the President. White says Cohn didn’t write the email, is careful not to put stuff in email generally, and is considering taking legal action against Wolff. Fortune’s Shawn Tully finds a section suggesting Trump’s friend Tom Barrack said the President is “not only crazy, he’s stupid'” as similarly unconvincing. Barrack denies it, doesn’t speak that way generally, and says he never talked to Wolff. The bottom line is that Wolff is cut from the same cloth as both Trump and Bannon. “We’re talking about three people,” Podhoretz says, “for whom the truth is fungible.” Facts have become the great casualty of 2017. Contrary to the late Senator Moynihan’s famous dictum, everyone now seems entitled to his or her own. One final observation: given all we know about Wolff and his style of journalism, why would the White House cooperate with him? 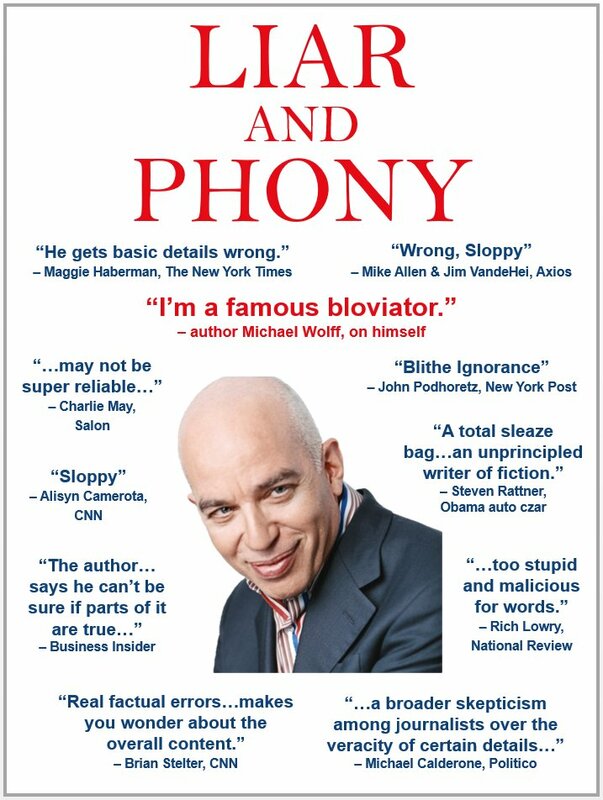 The answerappears to be that Wolff said and wrote a number of flattering things about the president. Which offers a lesson for all those seeking entrée to this White House. The initial 200,000 hard copies of the Book sold out immediately as reported by the Hollywood Reporter!! !